Mark Sharpe is Chief Potential Officer for Tampa, an Innovation Partnership whose mission is to create a vibrant, magnetic place to live, work, study, play and stay in the 19-square mile area bounded by Busch Boulevard, Bearrs Avenue, Interstate 275 and Interstate 75. The region includes parts of Tampa, Temple Terrace and unincorporated Hillsborough County and is anchored by some of the most ground-breaking, innovative institutions in the world. In 2015, Mark successfully negotiated $2 million from Hillsborough County to be designated for the development of an innovation district in the area. His team secured $1.25 million from the State of Florida for transportation, community engagement, and branding, and he led a multifaceted collaborative effort to win a $3.8 million TechHire Grant and designation by the White House as a TechHire Community in 2016. In fewer than three years Mark and his staff have grown membership in the from just 4 to over 230 business and community members, anchored by the University of South Florida, Florida Hospital, Busch Gardens, Moffitt Cancer Center, RD Management, LLC, and the James A. Haley Veterans’ Hospital. Prior to leading the Tampa, Mark served for 10 years as a Hillsborough County Commissioner before reaching his term limit. In 2010, he joined forces with Tampa Mayor, Pam Iorio to lead a referendum effort for a 1-penny sales tax for transportation improvements. While the referendum was unsuccessful, improved transportation has been identified as one of the key priorities of the Tampa and Mark continues to work toward innovative solutions that will help people get around more efficiently. Mark is passionate about applying innovation to overcome challenges. He founded the company, Hog Back – named after a geologic formation of narrow crested, steep sloped, hard-to-climb hills – to help others clear obstacles and find success. 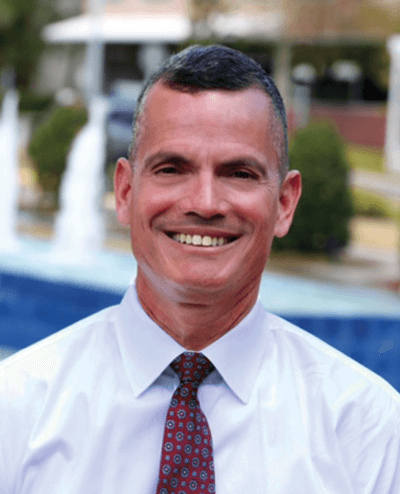 He is a 20-year Navy veteran with a BS from Florida State University in Multinational Business and an MA from the University of South Florida in Strategic Studies. Mark is married to Stephanie, a high school English teacher, and they are parents of three children.